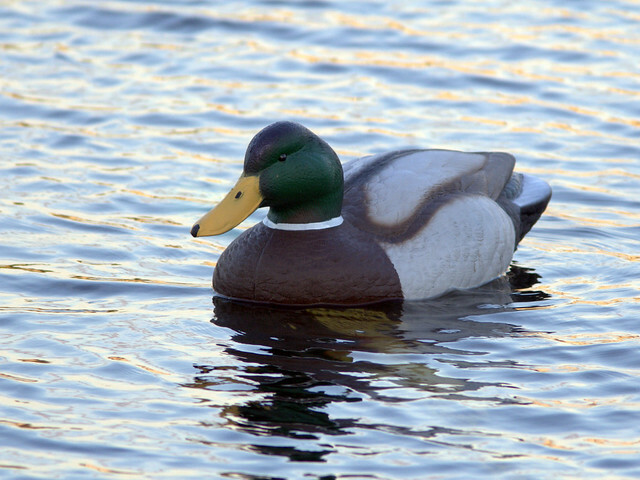 I apologize for anthropomorphizing, but hey, ask any duck hunter whether a decoy can actually fool a bird. Our latest Yard Bird cost us $1K plus. 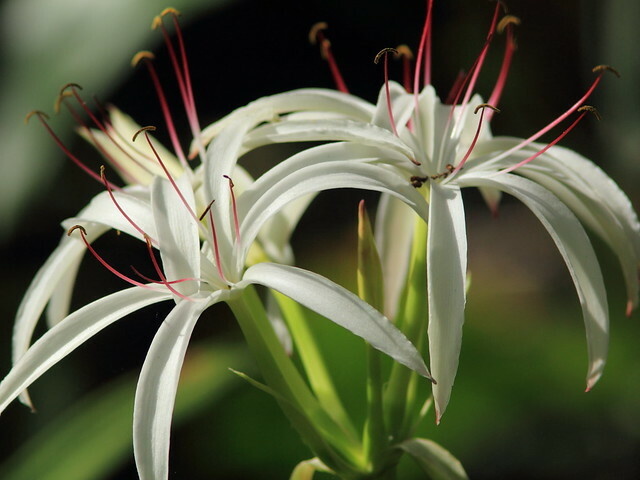 We obtain our lawn irrigation water from the backyard lake, a pretty good deal, considering that household sewer charges are greater than and keyed to domestic water utilization. Now the downside– the lake water is full of debris, including mud, vegetation, small fish and snails that can be sucked into the inlet, clogging sprinkler heads, increasing back-pressure and damaging pumps. The filter screen on our intake had deteriorated, and the float that kept the intake off the bottom of the lake sprung a leak. Result? Sucked-up mud led to a burst main feeder line (under our deck, no less! ), requiring excavation and re-routing of half our sprinkler array. So much for “free” water! 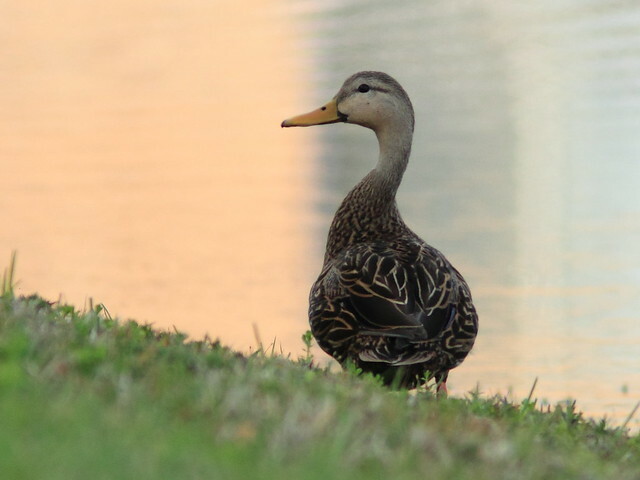 Our new “unsinkable” float is this nice Mallard, quite a departure from the Canada and Snow Geese that keep our neighbors’ sprinkler intakes up off the bottom. 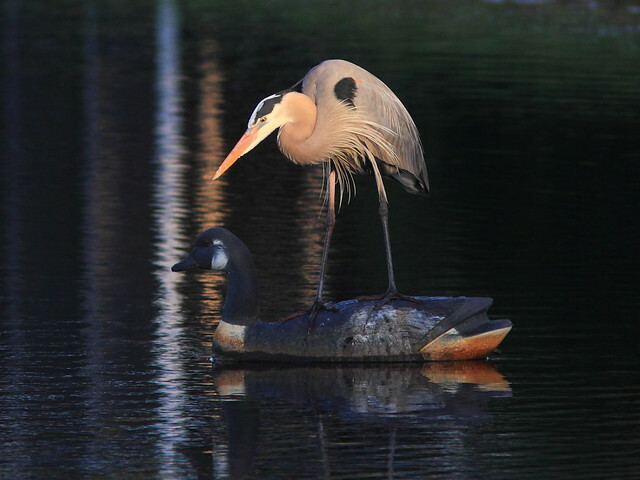 As if this were not enough, as I was photographing the unrequited lover in the fading light, I looked over at our neighbor’s Canada Goose float and, for the first time ever, found it was being used as a fishing platform by a Great Blue Heron! At sunrise, only a couple of weeks ago, the wetlands next to our subdivision were eerily quiet. On the way in, I checked the levee to see whether there were any Bobcats hunting there. Mary Lou kept walking up the gravel road, as I told her I would catch up with her in a moment. No Bobcats were present, and indeed the place seemed nearly devoid of birds. Even the mockingbirds were not singing. 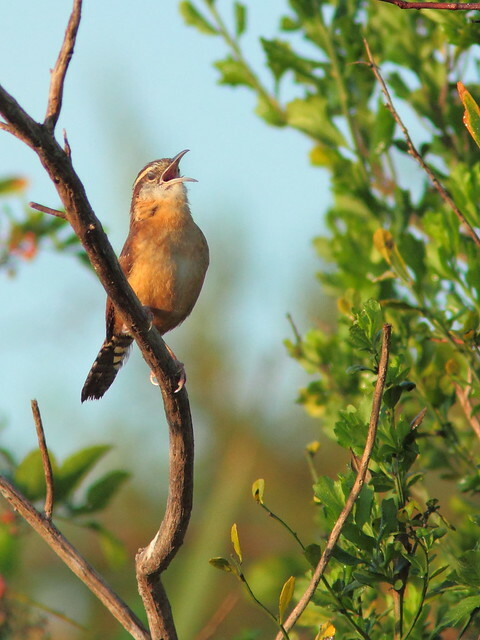 The silence was broken by an energetic Carolina Wren who poured out his song. 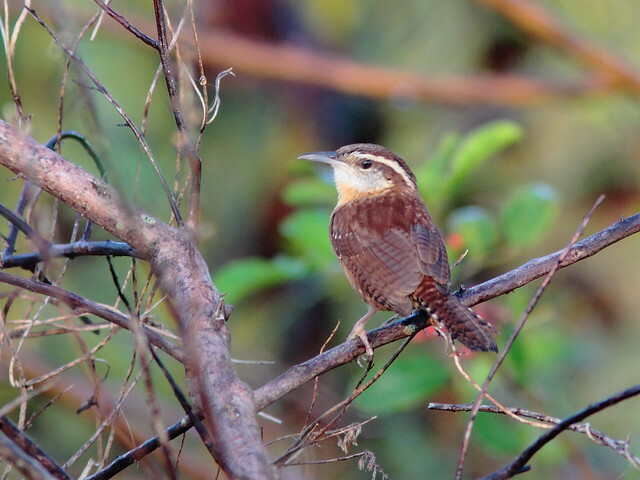 I waited patiently and took about 20 photos as the wren lurked about in the brush. Here, he paused quietly out in the open for a photo op. 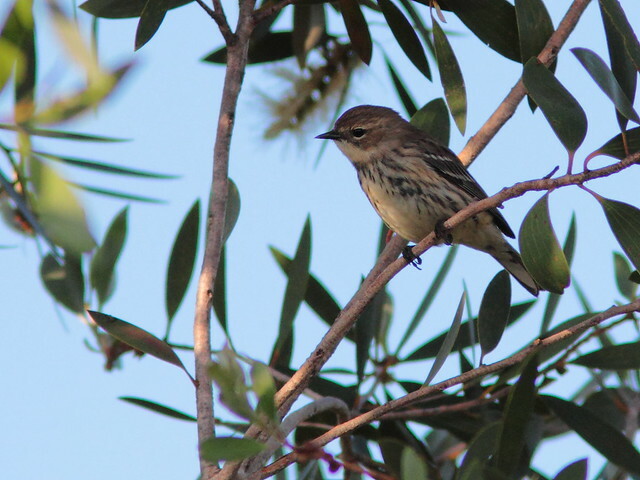 Small flocks of Yellow-rumped Warblers foraged in the treetops. We met up when she was on her way back. 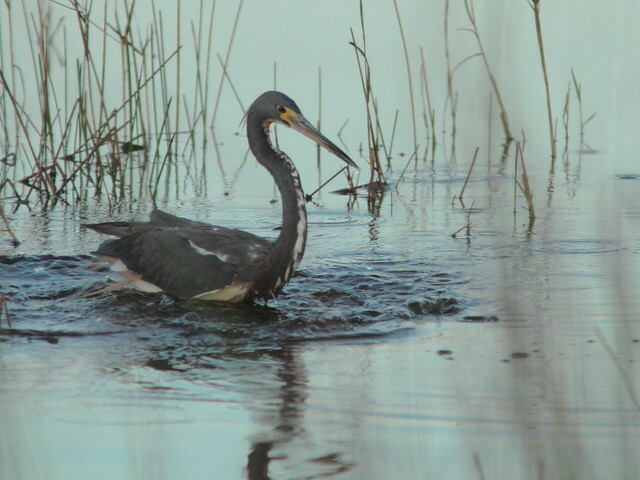 At the lake’s edge, we saw this Tricolored Heron chasing after fish in its usual haphazard and aggressive manner. 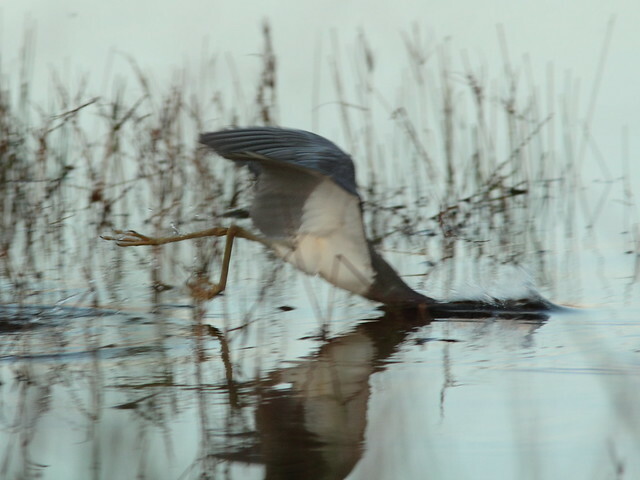 Suddenly, the heron took flight and then immediately dove headfirst into the water in pursuit of prey, kingfisher style! I was not quite ready, and this is not a very good shot, but I was amazed to see its head and neck under water and both of its legs sticking up. 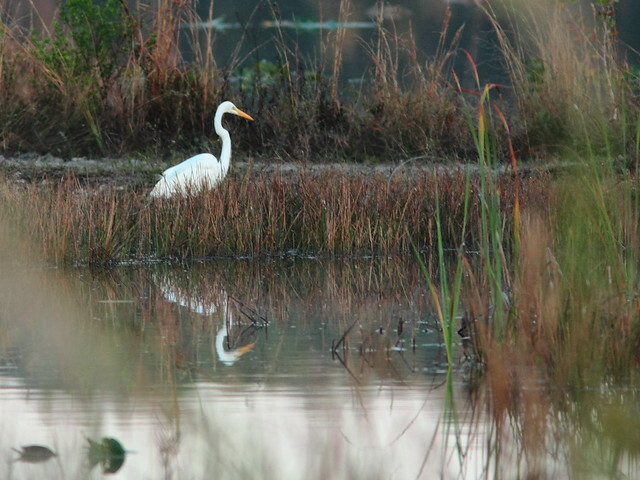 A Great Egret cast a quiet reflection. 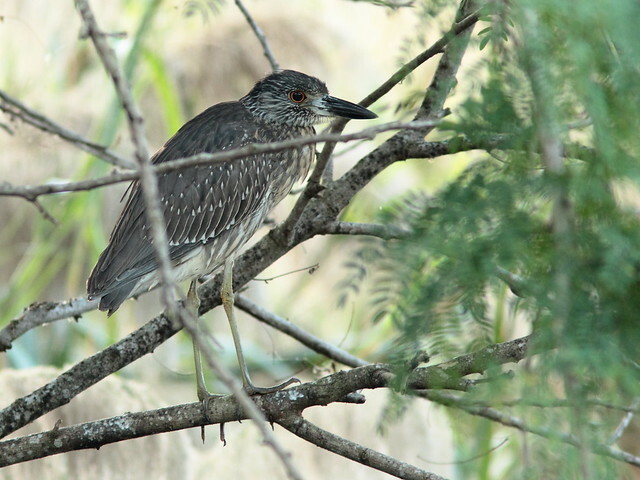 I continued alone to the end of the road, where I was pleased to see that a few Yellow-crowned Night-Herons had returned to the area where they had nested last spring. This week there has been a notable increase in the dawn chorus. 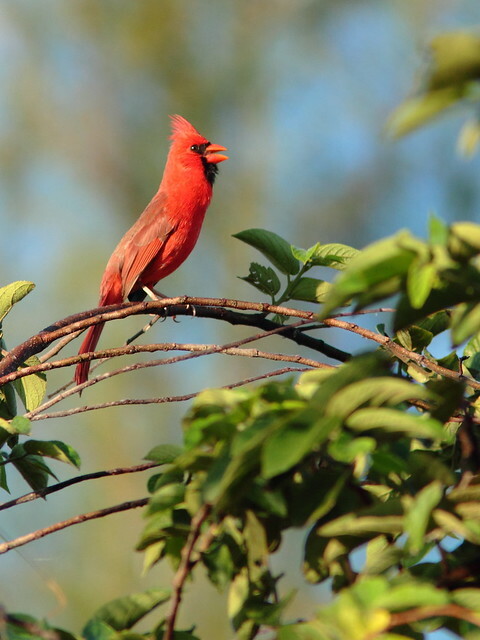 Cardinals and towhees were singing vigorously. 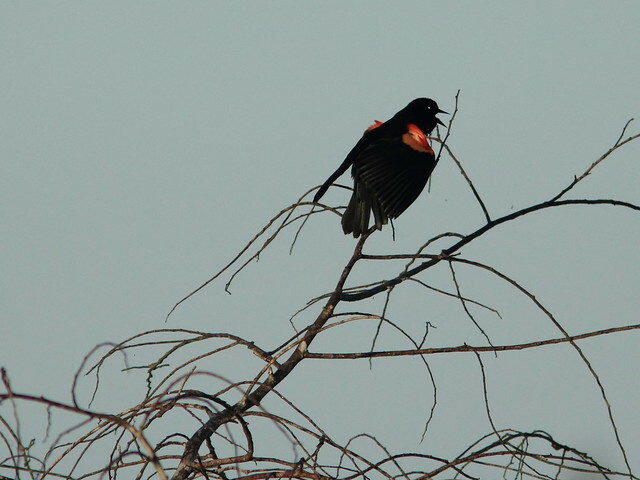 Red-winged Blackbirds were staking out territories and singing “Conk-ra-lee,” their red epaulets expanding with each burst of song. This Northern Cardinal’s plumage looked a little worse for wear. Love must be in the air. 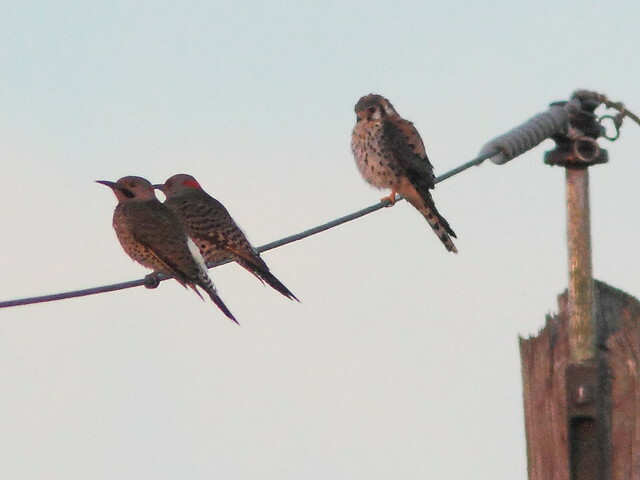 A cozy pair of Northern Flickers shared a distant wire, ignoring an American Kestrel. 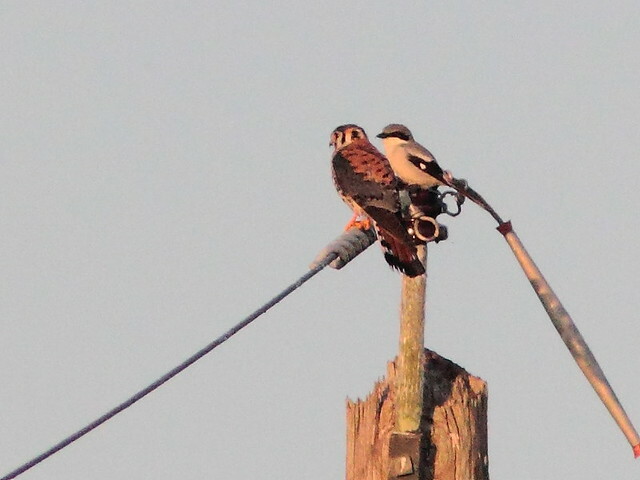 Later, the kestrel was back on the wire, this time almost shoulder-to-shoulder with a Loggerhead Shrike! This male was probably a local resident, as it has white eyes. 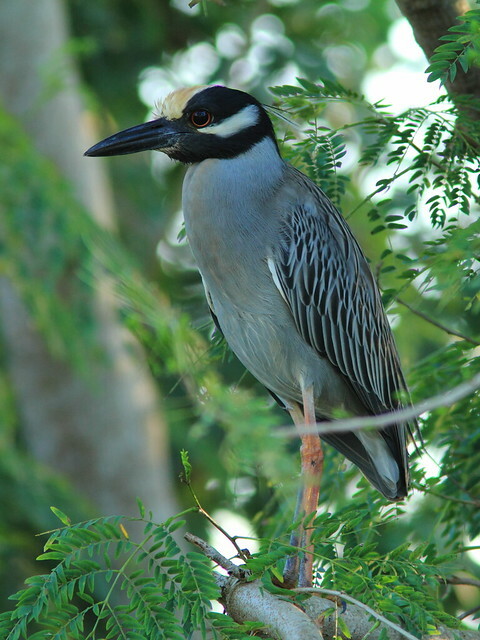 Birds from southern Georgia and Florida have straw-colored to white irises. 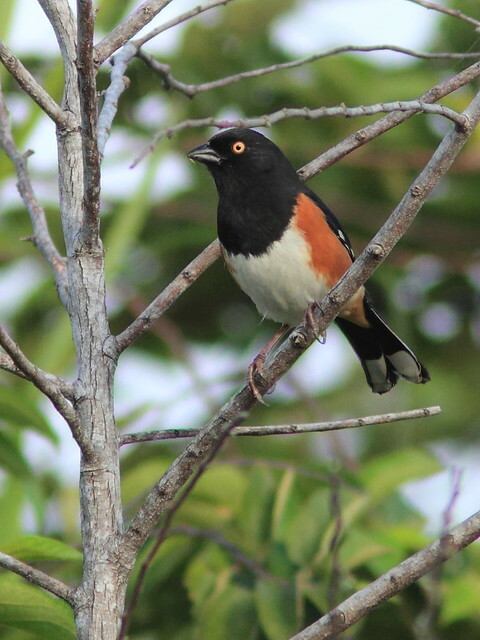 Another towhee had decidedly reddish eyes, indicating it was likely a visiting migrant from further north. 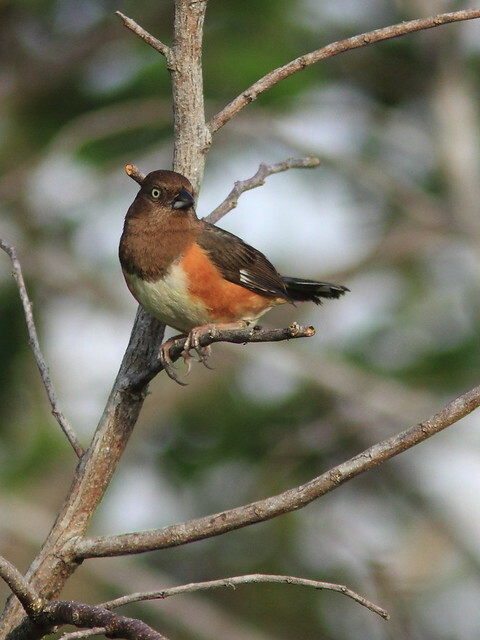 Interestingly, the red-eyed towhee was accompanied by a female with pale eyes. We performed our regular welfare check on the local eagle nest. This year there is only one eaglet, the ninth offspring recorded during the five seasons the nest has been under observation. The female was standing watch, and just as we arrived, the male swooped in dramatically to join her. 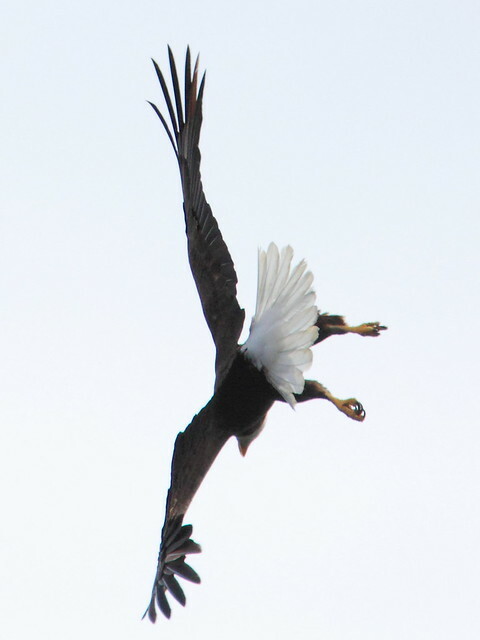 The female flew off and the male departed for about an hour, returning with a fish, which it fed to the eaglet. We named her/him “P. Piney Nine.” Click here for a summary of key events in the life cycle of this pair of eagles over five seasons. 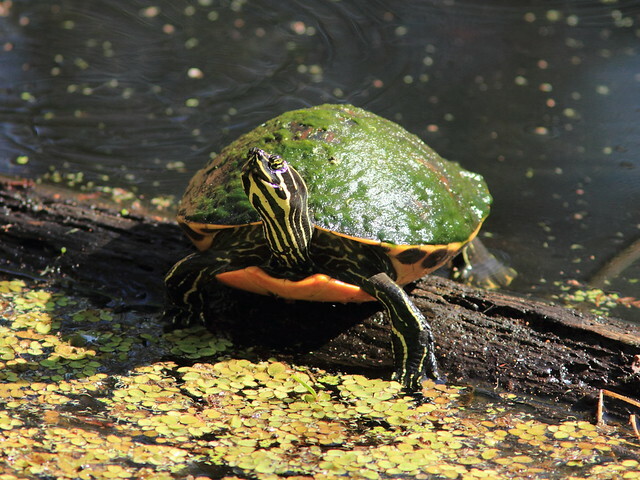 From our south Florida home, it’s an enjoyable two hour drive to Corkscrew Swamp Sanctuary, just east of Naples. 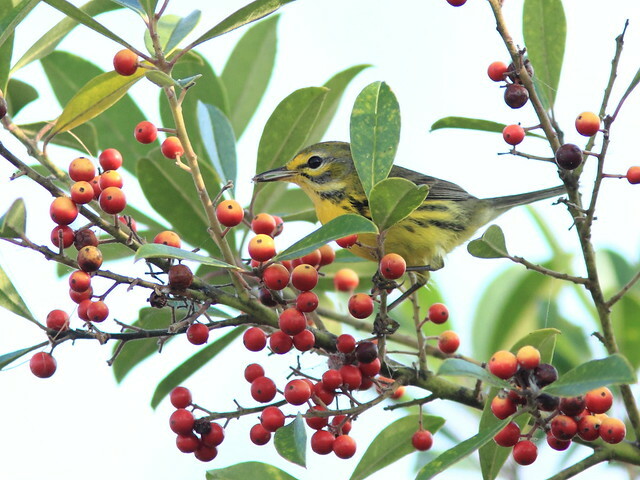 Located in the western Everglades, and administered by the Audubon Society, Corkscrew’s 14,000 acres include a variety of habitats, including 700 acres of virgin Bald Cypress, the largest remaining stand in the world. 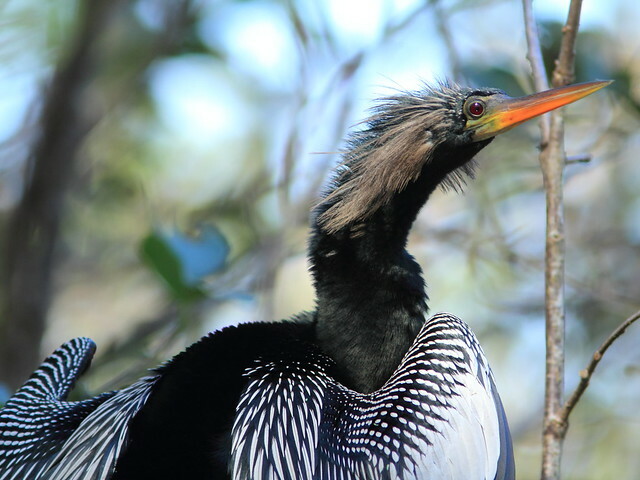 The old-growth cypresses have been host to the largest breeding colony of Wood Storks in the US. However, the storks have done poorly the past several years since 2006, when there were 600 nesting pairs. In 2007, 2008, 2010, and 2011 there were none. The exception was 2009, when there were 1120 nesting pairs. Sadly, the storks failed to nest again this year. An interpreter pointed out a long line of tall cypress trees on the horizon, which, at this time of year would normally have been white with nesting and roosting storks. We saw not a single one. 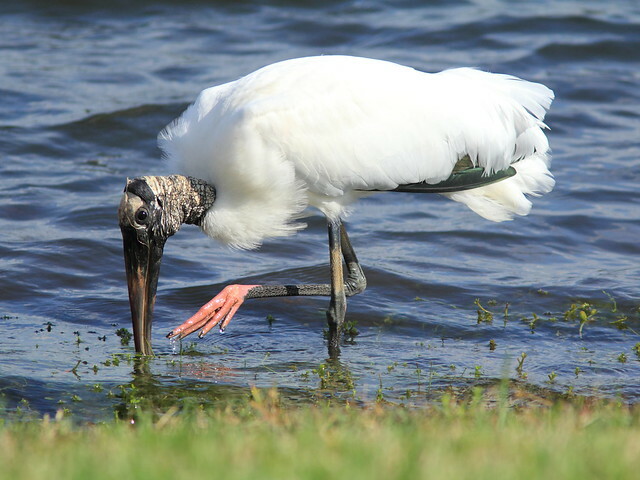 I discussed the problem in an earlier post “Struggling Storks.” Visit this link for updated information about the Wood Stork at Corkscrew Swamp. 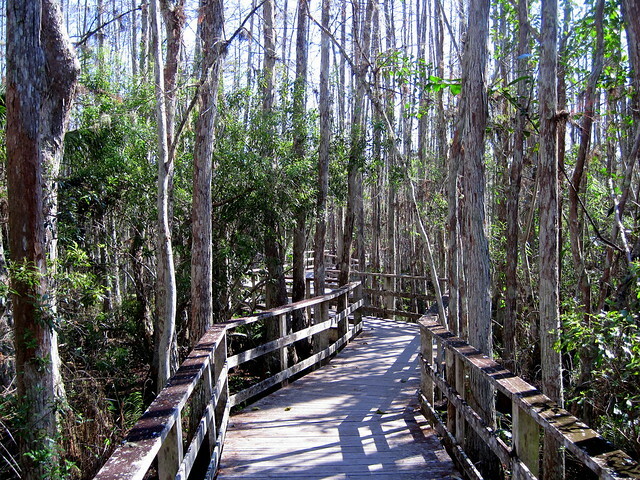 A 2 1/4 mile Boardwalk winds across pine woodlands, a wet prairie and through a stand of Pond Cypress. 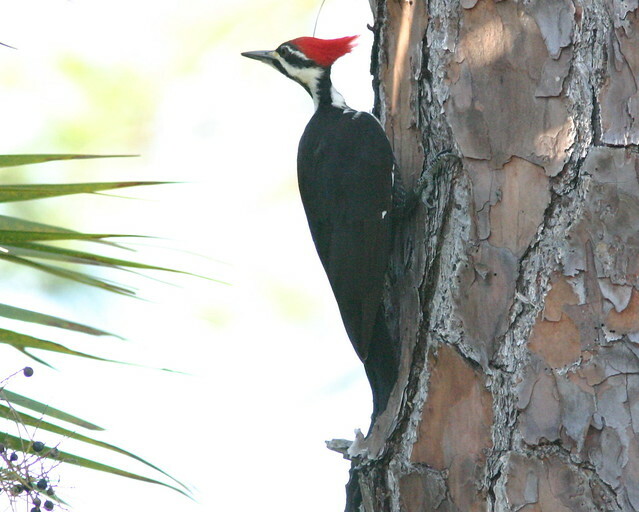 At any time of year, a visitor can expect to see Pileated Woodpeckers. 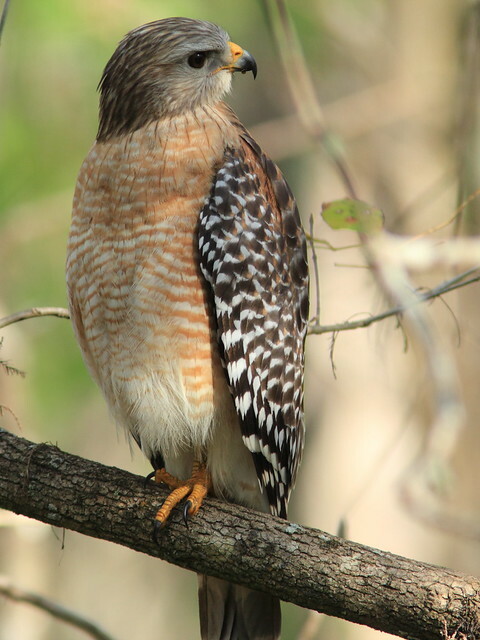 We got breathtaking views of Red-shouldered hawks. A pair were engaged in courtship above the boardwalk. 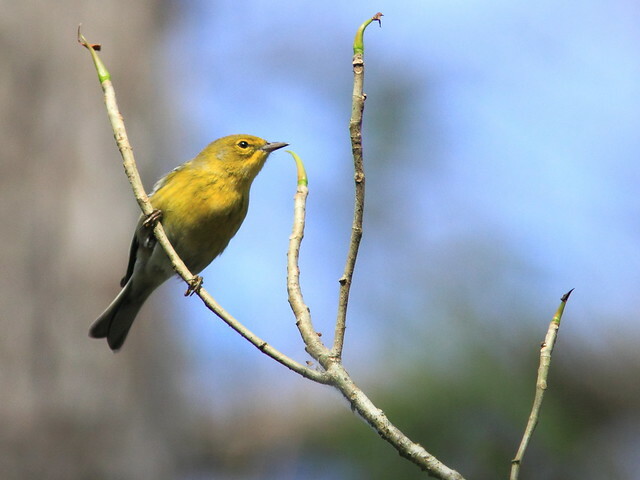 The onset of spring migration of land birds is still a month away, so there were only a few warbler species– Yellow-rumped, parula, Yellow-throated, and Pine Warblers. Northern Parulas foraged high up in the trees. 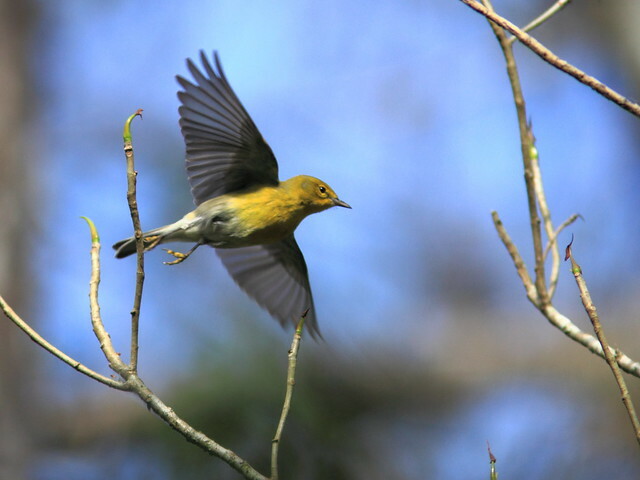 I accidentally caught this Pine Warbler as it flew from its perch. 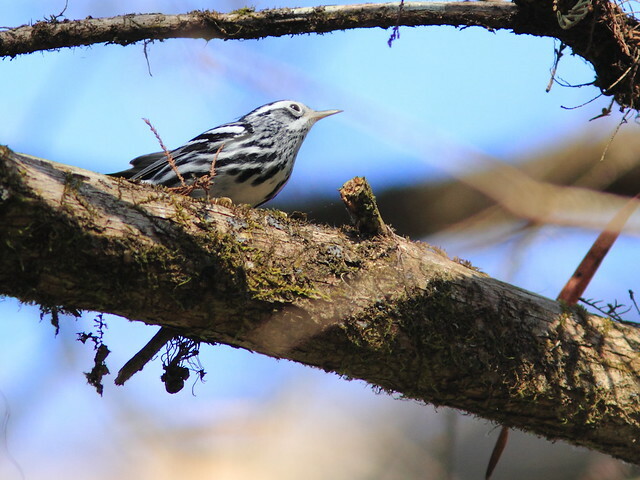 We saw two Black-and-white Warblers. 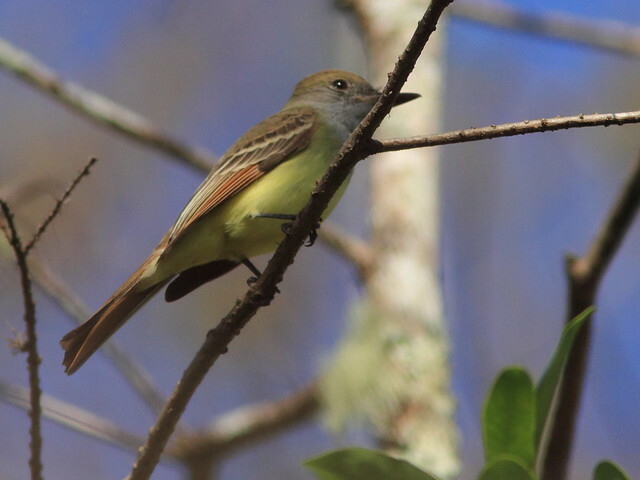 There were quite a few Great Crested Flycatchers. 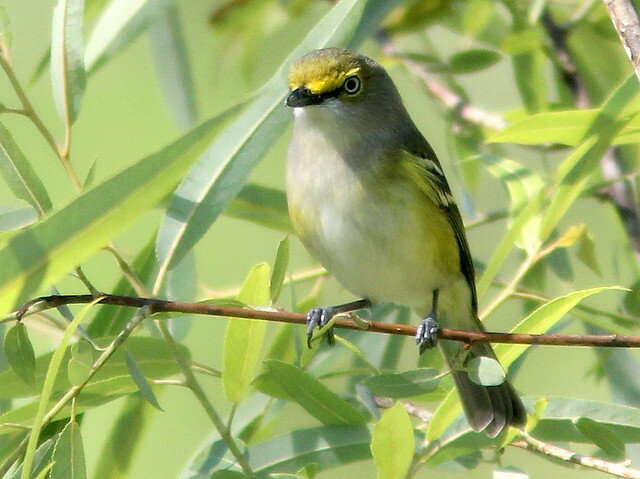 White-eyed Vireos were present but elusive. Last March, this one posed along the boardwalk. 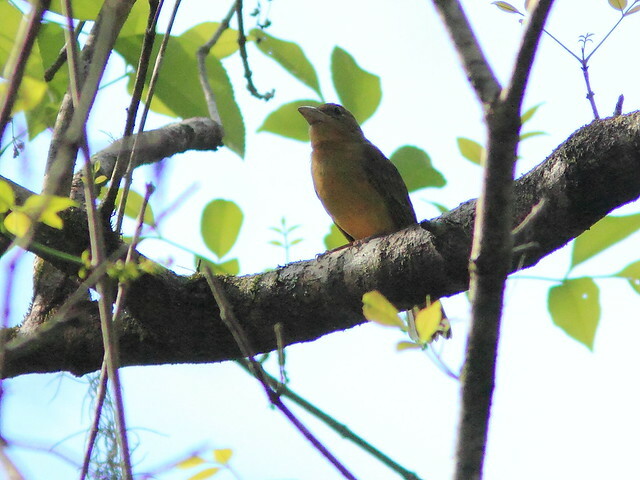 The light was poor in the understory, so this photo of a Summer Tanager came out badly. 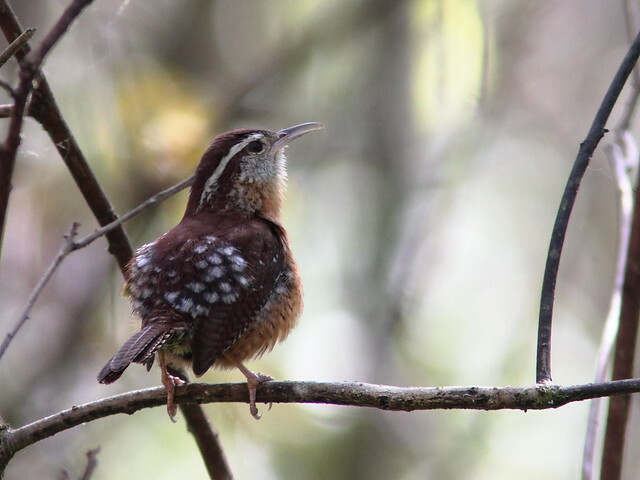 A male Carolina Wren sang loudly, accompanied by the softer twitter of a female. 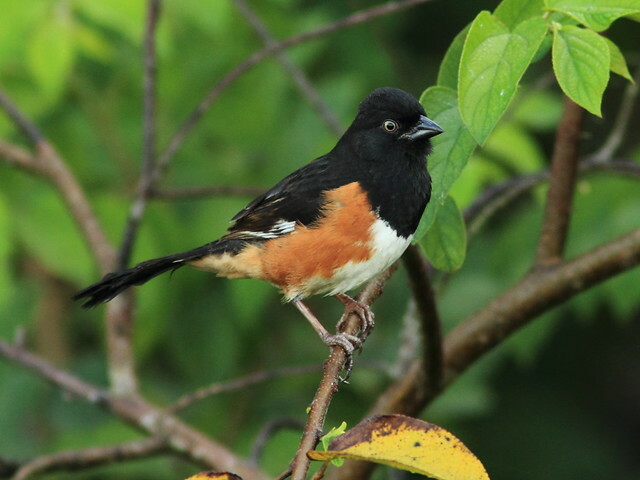 The angle of this photo of the male demonstrates the white back spots that are not always very evident, as they are normally covered by the wings. 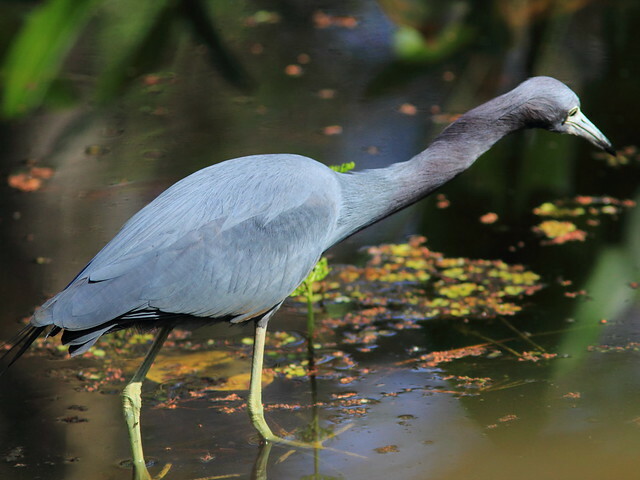 A Little Blue Heron’s head swayed back and forth, helping it judge the distance of an underwater prey item. 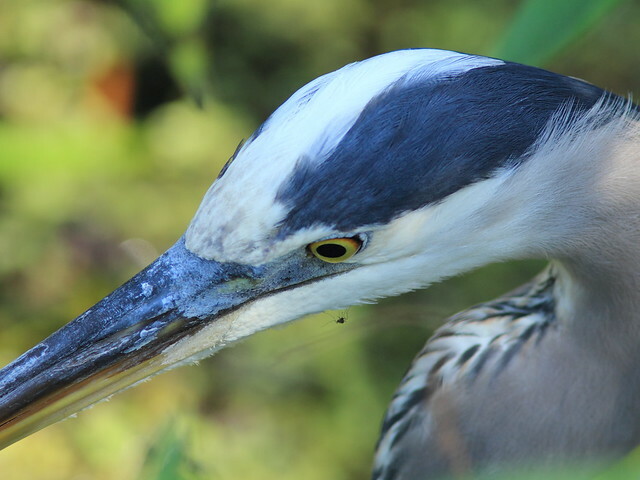 A Great Blue Heron was so close that this is all I could fit into the viewfinder (I did capture the entire mosquito on its chin). Wintering Painted Buntings are reliably present at the feeders in Corkscrew Swamp, but we missed them by a few minutes this time. 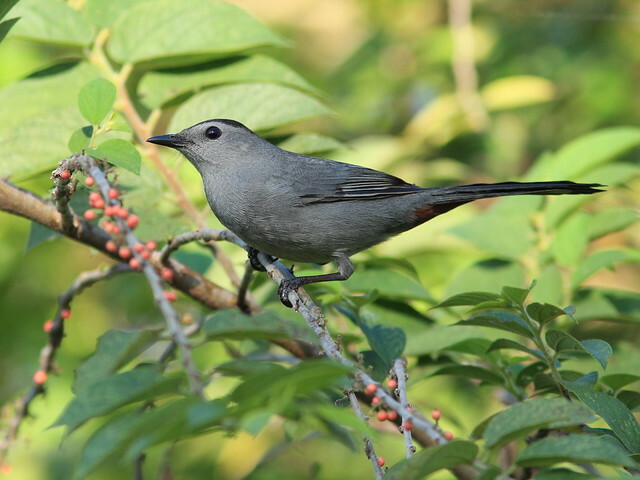 We waited almost a half hour for their return, but the only visitor to the feeders was a pregnant Big Cypress Fox Squirrel, classified as a Threatened species. 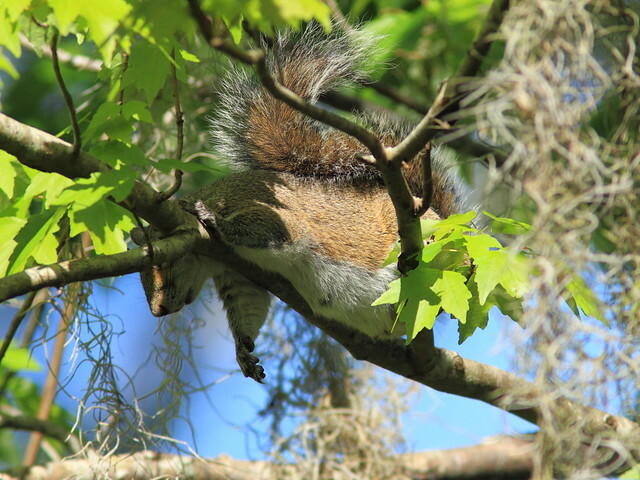 She filled up on seed and just fell asleep on the branch next to the feeder, her legs hanging limp. 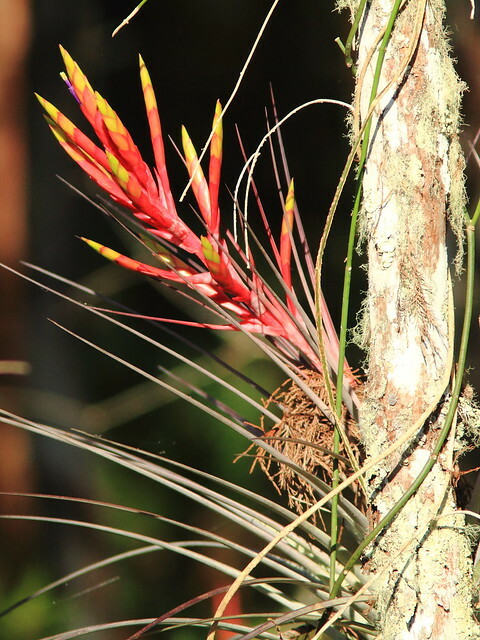 …and a Cardinal Air Plant. On Saturday (February 11) Mary Lou and I watched the local Bald Eagle nest for over an hour from a little before 8:00 AM. It was cloudy and 70 degrees (F) with a mild breeze from the west. It had rained during the early morning hours. When we arrived we found no adult eagle on or near the nest. No eaglet was visible. The female was drying her wings in the dead Melaleuca grove to the west of the wooded area. Oh the joys of motherhood! She had been soaked. Her eaglet(s) has apparently not learned to mute over the side of the nest (or has a bad aim), so she is also stained with its excrement. The wind picked up and shifted to the NW and the eagle changed position to face into the wind. A light rain started falling as we departed. At no time did we see any eaglet. A couple of other watchers arrived just before we left, so I hoped they were able to visualize a prey drop and maybe determine whether there is another eaglet in the nest. The next day (Sunday morning, February 12), Mary Lou and I checked on the nest at 10:00 AM. 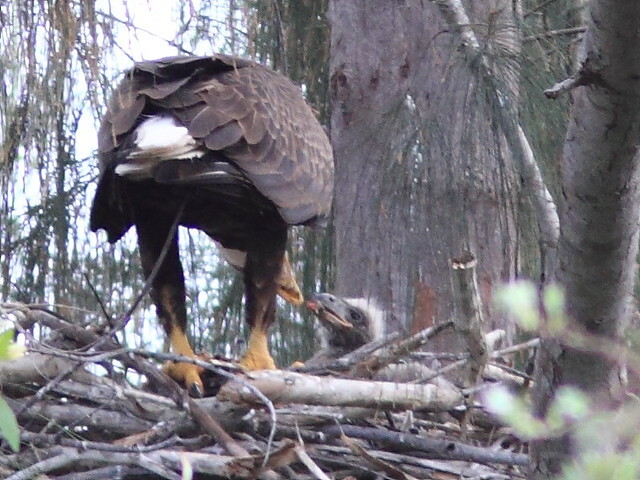 The first-hatched eaglet was four weeks old. 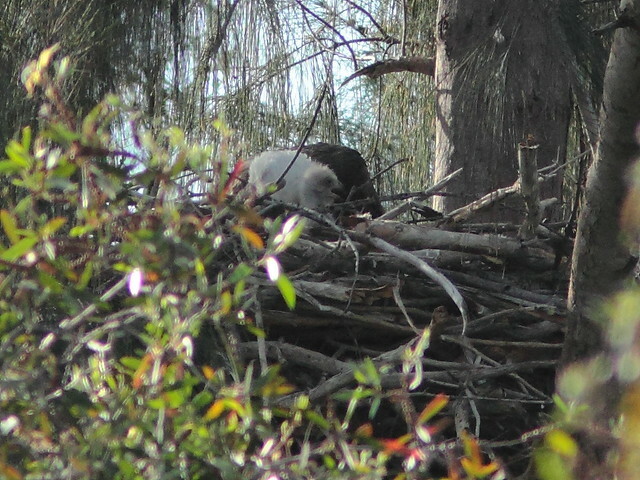 So far we had seen only a single eaglet on the nest. It was 50 degrees (F) with a brisk wind from the north. We immediately heard very loud cries coming from the nest. 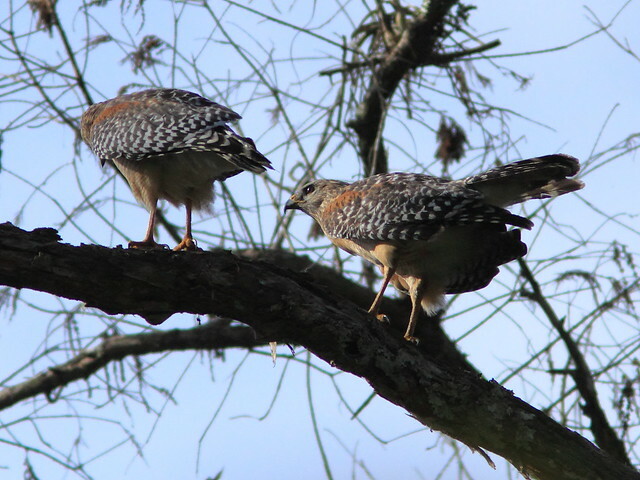 Both adults were together on a branch a few feet above the nest, flapping their wings and shrieking. There may have been a mating attempt, or they were fighting. Before I could raise my binoculars or camera, the female suddenly dropped directly down on the nest, not in controlled flight, and the calls stopped. The male continued roosting above the nest for a few minutes while the female engaged in feeding the young chick(s). One chick popped its head up quite high, but had almost disappeared from sight when I took a few photos. 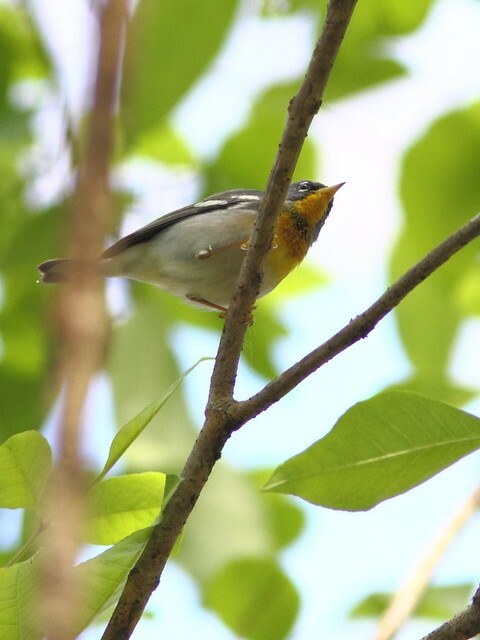 Only the top of the head of one nestling is visible in the photo below. 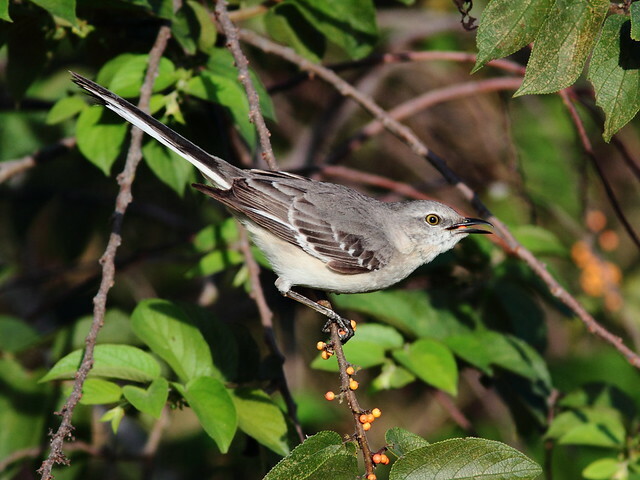 The male then flew out towards the road and to the east, disappearing to the south at the corner of 208th Avenue. Several of my photos strongly suggest that the female has been recently injured. Abrasions or small lacerations were visible both above and below the anterior brow. The lower injury was quite close to her left eye. Sometimes the birds get bloodied from dissecting prey, but this does not look like simple blood smear. I wish we had arrived just a couple of minutes earlier so we could better interpret the unusual behavior. The female then settled down to shelter the eaglet, and almost disappeared from sight. 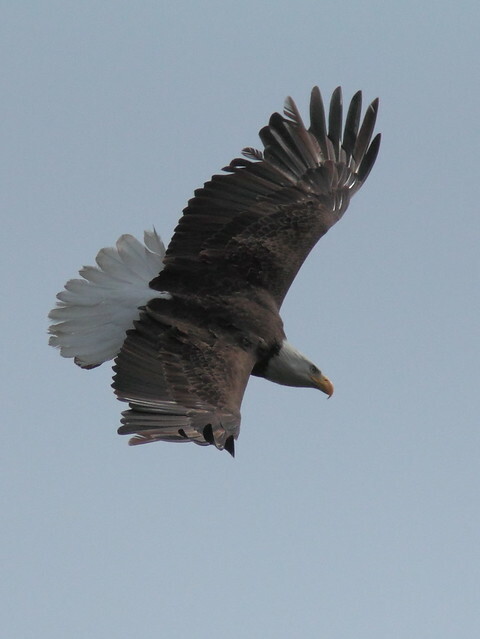 This morning (Tuesday, February 14) we watched the Bald Eagle nest for a little over an hour, starting about 9:30 AM. The adult female was roosting on a horizontal limb above the nest. We could see the top of the head of one eaglet on the nest. A sub-adult Red-shouldered Hawk flew in and perched about 10 feet above the eagle. The eagle called briefly but otherwise seemed not to pay attention to the hawk, which flew off after a few minutes. The male eagle suddenly appeared high over the nest, approaching from the south. He appeared to be carrying prey, but he continued in a NW direction. 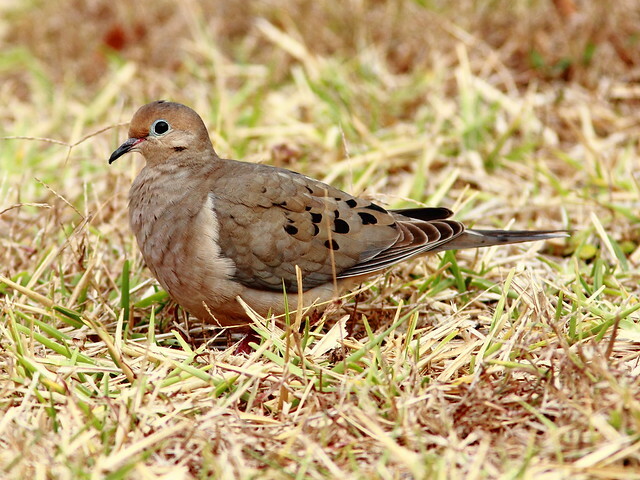 The female (photo below) flew after him and both disappeared in the distance. Shortly thereafter we were surprised to see the female return to roost in a dead Melaleuca trunk just west of the nest. I ran over to photograph her as Mary Lou continued to watch the nest. (I could see no sign of injury to its face as I had suspected earlier). Mary Lou called me on my cell to relate that the male had suddenly appeared on the nest, presumably coming in from the opposite side. The male tore at the prey, which appeared to be a white bird, and fed the chick. I took over 200 photos, trying to see if there may be a second eaglet, but they showed only a single offspring. Photographing the baby eagle was like spelling “banana;” I didn’t know when to stop! I’ve tried to limit my blog posts to once per week, but there is a backlog developing, so let me tell about today’s experience. 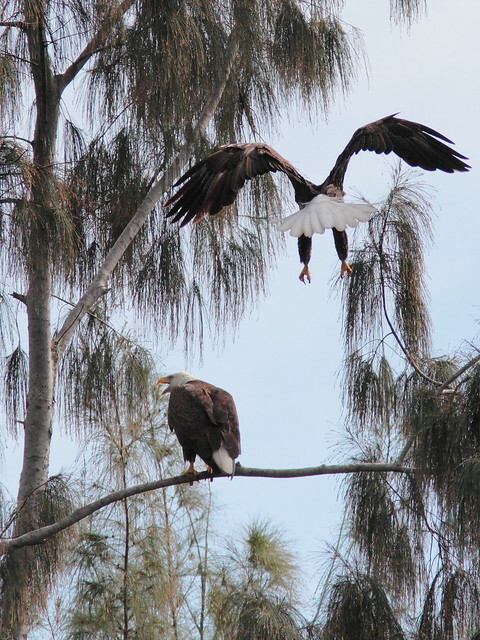 At about 9:45 AM this morning we checked on the welfare of the local pair of Bald Eagles at their nest, in Pembroke Pines, Florida near our home. The oldest chick is about 29 days old. We have only seen one eaglet so far, and today was no exception. When we arrived, the female was on the nest and roosting high, which we think meant that she was expecting a food drop. After about 25 minutes an Osprey flew low over the nest. Still no sign of any eaglets. After watching about 50 minutes, we were ready to quit when the male flew in from the back of the nest with unidentified prey. 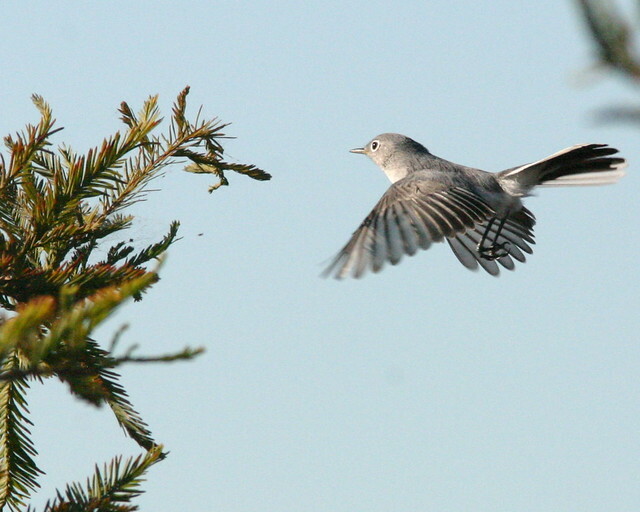 The male then roosted on the tall pine just west of the nest while the female tore at the prey and fed the young. I was busy photographing the roosting eagle when Mary Lou got a good look at the eaglet, quite high above the nest rim. I only got a few shots of the top of its head. Again, only one chick was evident. Here is another view. While the male was still roosting, an unusual raptor showed up in a flock of Black Vultures that were circling above the nest tree. Its very dark and heavy body, pointed and slightly uplifted wing tips, bulging secondary flight feathers that gave a rounded look to the trailing edge of the mid-wings, plus a sharp narrowing of the wings near the body suggested it was a Buteo, probably a dark morph of the Short-tailed Hawk. I could not confirm the ID until I looked at the rather poor and distant images on the computer. They showed a bright yellow cere and light areas at the base of the outer primaries, consistent with Short-tailed Hawk. This was the first time I’ve seen this species over the nest, though it does occur in the wetlands near our home about 1 1/2 miles to the SE. Short-tailed Hawks occur in both a dark and a light morph. 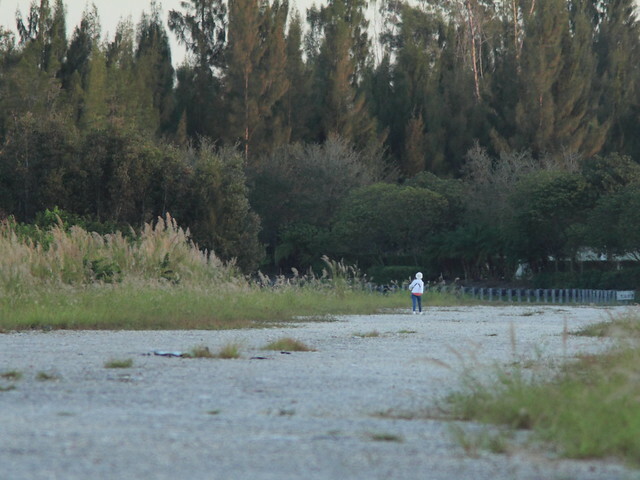 The former is said to be more common in South Florida. So far, I have only seen light morphs in our local wetlands. It is quite possible that I have missed other dark Short-tailed Hawks as I do not always scrutinize every kettle of vultures. Short-tailed Hawks eat birds, and it is said that they may associate with vultures to better conceal their presence to prey. When I first saw this Short-tailed Hawk, its red tail made me think it was a Red-tailed Hawk. However, there is no red pigment in its tail, and the redness is attributed to scattered or diffracted light passing through the structure of the tail feathers. Here is another view. 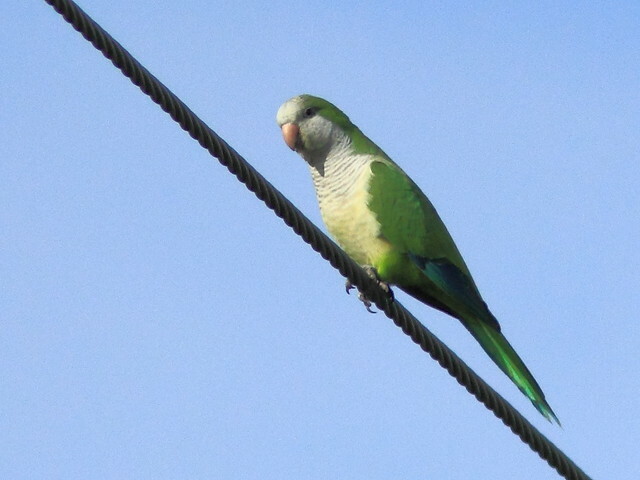 We also had several Monk Parakeets roosting on wires near the nest. This week we have spent a lot of time watching the local Bald Eagle nest. 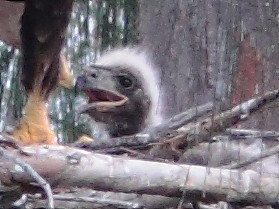 A 19 day old eaglet finally peeked over the rim on February 2. Birding in mid-winter here in South Florida, we face some distractions. 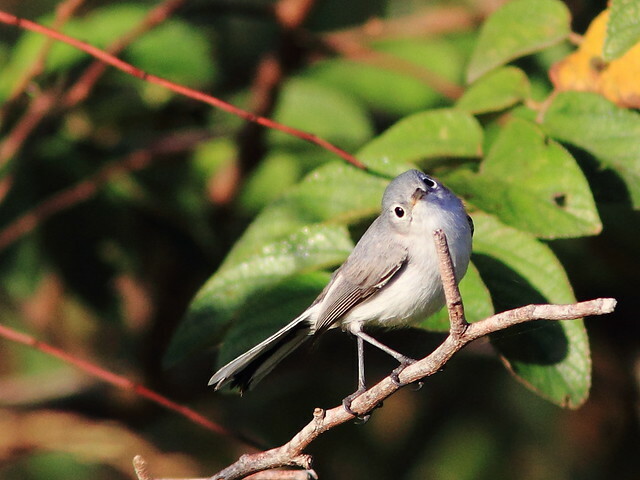 Small birds have so many places to hide, as most of our trees are evergreen. Even the deciduous trees such as maples not only hang on to their old leaves, but new leaves start growing in January. Cypress trees gracefully turn from green to yellow to golden and brown, perhaps going “bald” for part of a month before putting out new greenery. Then there is the wind. 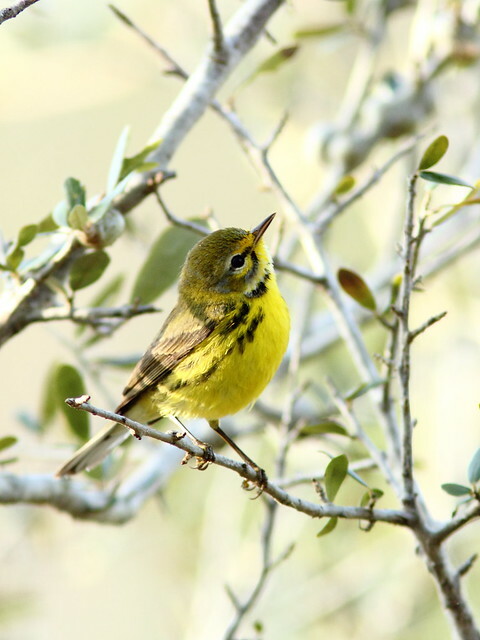 On a still morning, it is easy to discern the tremble of leaf or twig, signaling the presence of a reclusive vireo or warbler. As the sea breeze builds, it scrambles the input to the rods in our corneas that normally alert us so efficiently to the slightest peripheral movement. Bazillions of fluttering butterflies vie for our attention. Note that I avoided the harsh term of “trash birds,” sometimes used in an offhand manner by birders when they only see common species. I have written before about finding “Beauty in the Commonplace” as well as in some real “Trash Birds,” notably the exotic Sacred Ibis and the Purple Swamphen, both of which have been deemed a threat to native avifauna and have been subjects of eradication campaigns (dismally unsuccessful in the case of the swamphen). 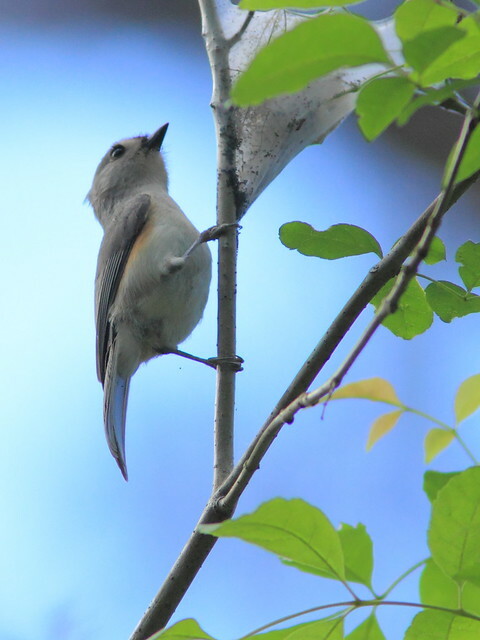 One recent morning when a small flock of Blue-gray Gnatcatchers flew into the Trema tree where I was hoping to see something more “unusual.” I realized that I rarely get very good images of them. I don’t know how to make them stand still, and these birds were very active. Yet, despite their perpetual motion, they generally stayed in sight. The light was perfect. 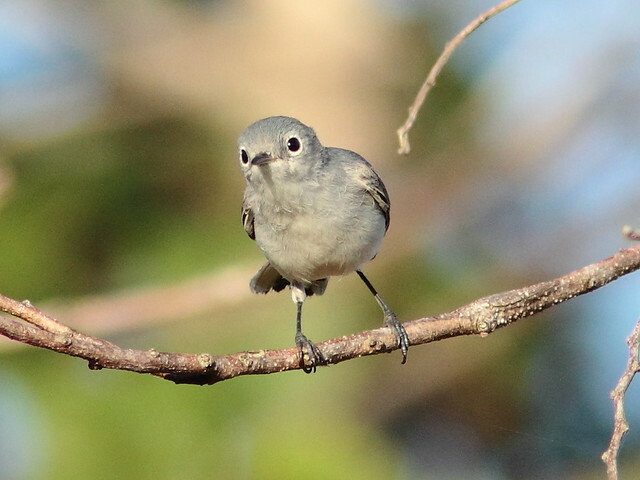 I focused my full attention on these little sprites, even ignoring the calls of nearby towhees and a White-eyed Vireo, and took over 50 photos. My trouble now is that I cannot bear discarding most of my shots. 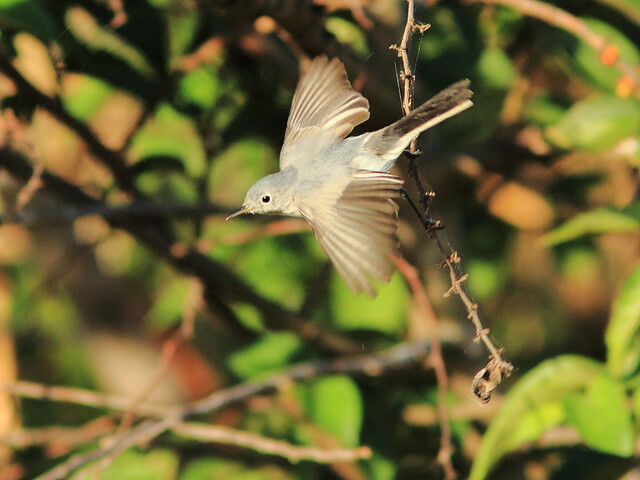 So I hope you can put up with an overdose of gnatcatchers. …and came in for a better look. …and then treated me to a high dive. 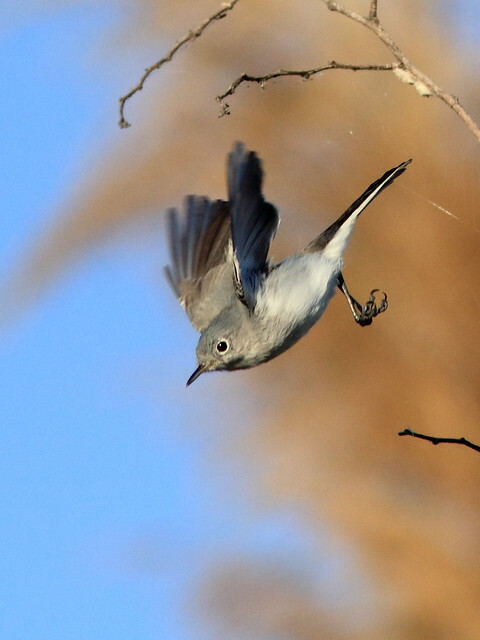 I was delighted to catch a few flight shots, usually quite by accident. This was my favorite flight shot, taken a couple of years back. 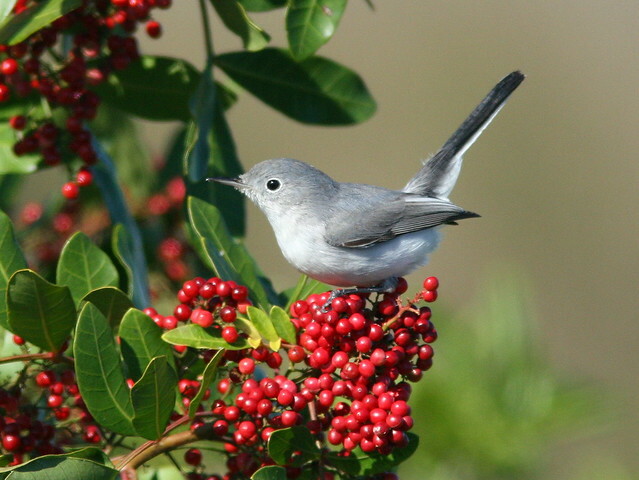 Two years ago, a gnatcatcher landed momentarily on a clump of invasive exotic Brazilian Peppers, providing me with my all-time luckiest image. 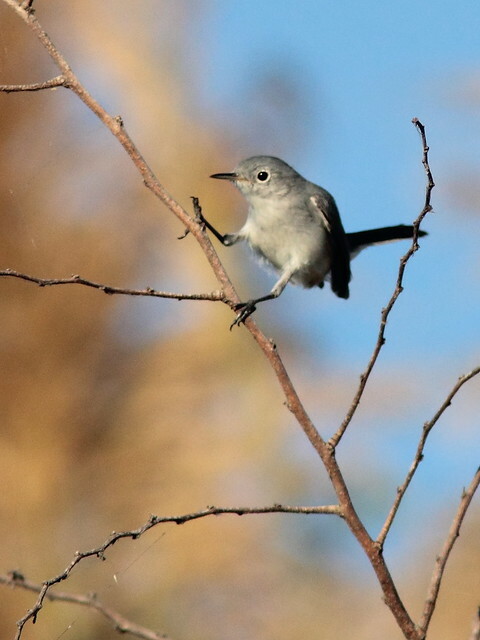 Well, I did finally break away from the gnatcatchers, or more correctly, they moved on as is their habit, and I started paying attention to my surroundings. 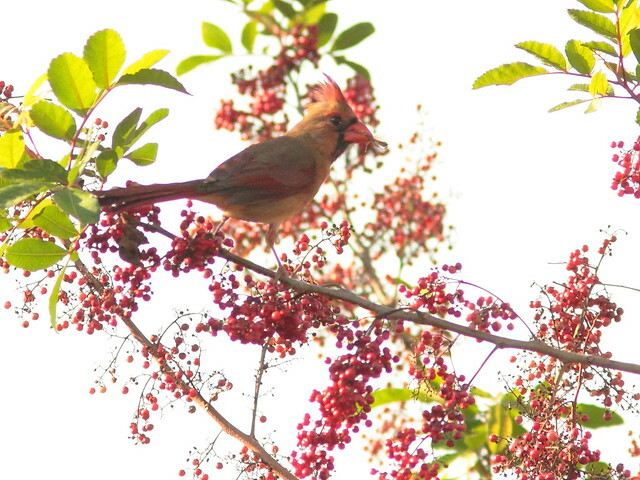 This female Northern Cardinal gave me a red-on-red experience. 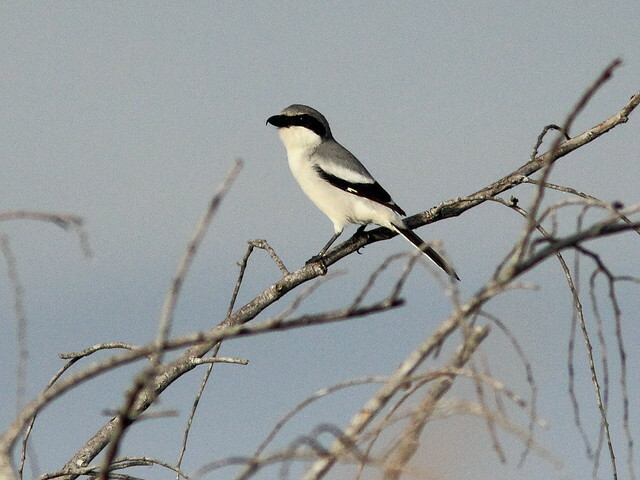 A Loggerhead Shrike called from a high perch. …and then came out into the open. …and a Wood Stork showed off its bubble-gum pink feet at the edge of our back yard.